Blackmagic Design pocket cinema camera announced with 4K HDR and and records Full HD videos at 120fps. 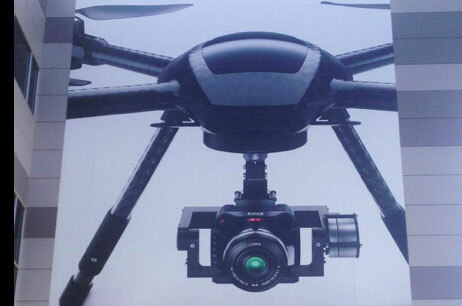 The camera is able to shoot 4K @ 60fps, uses M4/3 format sensor and lens mount. So, you can use your 4/3 lenses with the camera. The new cinema camera images are recorded into standard SD/UHS-II or CFast 2.0 cards in RAW and ProRes at up to 120 frames per second! The new cinema camera is optimized for performing in low-light, that’s why dual native ISO is being introduced with camera, the camera featured 13 stops of dynamic range and dual native ISO up to 25,600. On the rear side of the camera we have a large 5 inch display screen and the camera features built-in 4 microphones, mini XLR input, full sized HDMI, 3D LUT support, Bluetooth, USB-C Expansion Port and more! You can get adapters for PL, C, EF and more, so you can use lenses from manufacturers such as Canon, Nikon, Pentax, Leica and even Panavision! 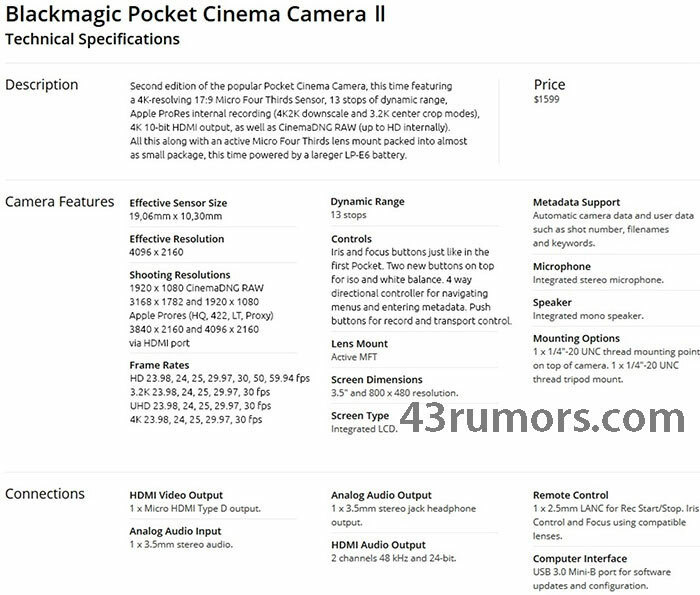 The new Blackmagic Cinema Camera – Cost you US$1,295 and shipping will start from Q4 of 2018. We have told you yesterday that black magic camera designs will going to announce a new camera on 3/3/2017. we have also given you the live streaming link of YouTube And finally today they have announced the camera Black Magic URSA Mini PRO camera. The black magic URSA Mini Pro cinema camera announced today is capable to record 4.6K video, the camera is dedicated for cinematographers. You will be surprised to know that this camera is a first step towards building a Universal Mount camera since it features EF Mount (Interchangable with PL and B4 mount). So it can accept Canon EF lenses, cinema PL lenses as well as it can also adopt the broadcast B4 mounts lenses. The camera will going to cost you around appox $6,000 but it is one of the best camera made by black magic yet. We can call this camera 3 in 1 camera that will going to satisfy the needs of broadcasters is Studiographers as well as film makers. Black Magic URSA mini pro camera initially available with three optional mounts, that is Canon EF, Cinema PL, or broadcast B4 mounts. The Good news is company is also planning to introduce Nikon F Mount and and hence the Mini Pro will become the first camera from the company that will going to allow you to use your own Nikon FX lenses in the camera. It’s a excellent news for Nikon camera users that they can use their lenses on the one of the most powerful Cinemas camera blackmagic USA Mini Pro. Talk about the features of this camera then according to the clay made by black magic the camera record XA Ultra HD 4.6 k videos and also features 15 stops at and with range always super white colour gamut and DaVinci color science. The black magic URSA mini pro camera directly compete against Sony FS7 and Canon C300 mark II camera. Without question, the Blackmagic Design booth at NAB drew a record crowd this year, and for good reason. Not only did they have an upgrade path for the URSA, via a new sensor and v2.3 firmware, they also introduced two new cameras, the first of which is the baby brother to URSA. The URSA Mini, as its called, has performance unheard of in a price point raging from 5k to $5500 US, depending on mounting options, Canon EF or PL mount. The URSA Mini, like its sibling, offers a new sensor with an astonishing 15 stops of dynamic range and an improved ISO versus the old 4k sensor, which had an ISO of400 andanadequate 12 stops of dynamic range. For Blackmagic and enthusiasts alike, this may be the camera everyone has been waiting for. 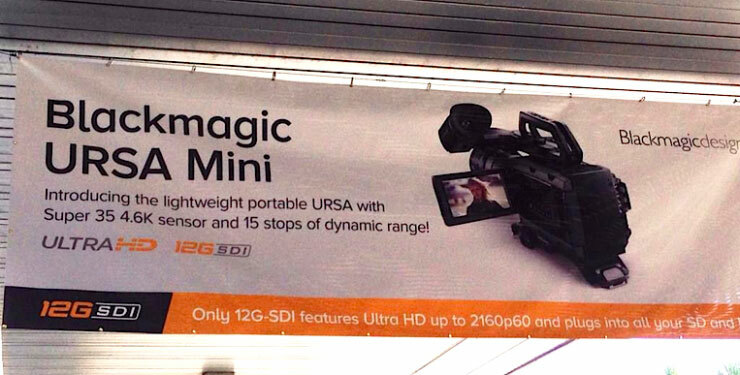 First of all, the new Mini weighs less the full size URSA. Coming in at 2.3 kg or 5 lbs., the camera weighs about a quarter of what the URSA does. Although this does not include the various items one needs to kit it up, this makes URSA Mini more than manageable for hand held work. To assist the operator in handheld environments, the Mini comes with an affordable accessory kit. The Mini has an optional shoulder pad, which attaches nicely to a quick release plate. But, that is not all. In addition to the shoulder pad, which can hold two 15mm rods, a handle accessory mounts on the top of the camera for carrying. An extender arm, which attaches to the base kits control handle, is reminiscent of Sony’s FS7. This accessory kit retails for $395 US and is a must have for hand held shooting environments. Although test footage will be forthcoming in the subsequent months ahead, the new sensor available for the Mini should render some amazing images. The new sensor, which sports a 4.6k resolution, is now rated at 800 ISO compared to the old 4k sensor. The old sensor had mediocre low light performance that I will not delve into here, as it is well known and has been documented at nauseam. The new sensor has an ISO range of 200-1600 ISO, a marked improvement over the previous 400-800 ISO offered on the Blackmagic Production Camera and the 4k URSA, which had a native 400 ISO. If the new ISO range and the 800 native ISO of the new sensor is any indicator of low light performance, the 4.6k sensor should be approximately 1 stop faster than the old sensor. So, theoretically, the new sensor should be a marked improvement in low light performance. If you thought the Blackmagic Mini only had one accessory kit available, you would be mistaken. With Blackmagic receiving feedback from shooters, they decided to enter the viewfinder market as well. The new viewfinder cabling attaches to the right side of the camera via a 4-pin XLR cable for power and a standard 3g SDI BNC connector. Yielding an astounding 1920×1080 resolution, the new viewfinder option sports real glass optics, agenerous diopter range to accommodate most operators, and an east to west adjustment to suit one’s ergonomical preference. Look for the viewfinder to retail for $1500 US. The new viewfinder is not the only viewing option. Like the original URSA, the Mini has a fold out high-resolution screen.Opposed to the 10in screen available on big brother, the Mini’s screen is 5in, but more than adequate as a viewing solution. Like the viewfinder option, the side monitor sports a 1920×1080 resolution and is as sharp and accurate as the larger 10in screen.In addition to being a viewing option, like all previous Blackmagic camera models, this new monitor features touch screen access to the camera’s menu. A production camera would not be a viable option without professional audio, and here the Mini does not disappoint. 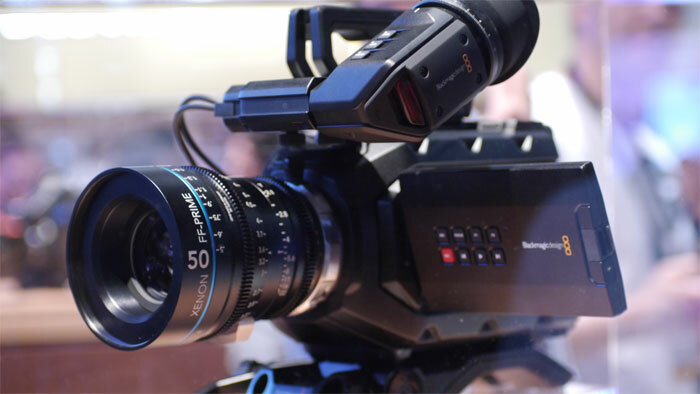 Mounted in a unique position on the camera, Blackmagic Design decided to place two XLR inputs on the top rear of the camera. Blackmagic claims that the XLR inputs will record 24bit audio at 48,000Hz, an excellent option for single system recording when audio quality counts. New for any Blackmagic camera, the Mini records more resolutions than ever before. Actually, the Mini has 7 different resolutions ranging from 1920×1080 to 4608×2592. Included resolutions are: 4608×2592, 4608×2304 (4K 16×9), 3840×2160 (Ultra HD), 3072×2560 (3K Anamorphic), 2048×1152 (2K 16:9) &1920×1080.These new resolutions can be recorded to CinemaDNG 3:1 180MB/s, CinemaDNG 4:1 135MB/s and variousflavors of ProRes CODES ranging from ProRes Proxy to ProRes 444. If the myriad of attendees mobbing the Blackmagic Design booth is any indicator, the URSA Mini prototype, which premiered at NAB this year, was a resoundinghit.Holding it on my shoulder with the optionalshoulder pad and extension arm mated to an Arri rosette on the shoulder pad baseallowed me to easily balance theMini on my shoulder, like a traditional ENG camera. The recording media, although still expensive C-fast cards, have come down in price slightly over the past six months. Look for the price to come down further now that the new Canon C300 Mark II requires the same media. With recording options galore, 15 stops of latitude, and better low light performance than its predecessor, the new URSA Mini will be the least expensive, highest quality cinema camera option availablein a growing and robustproduction marketplace. About the Author: Thomas Cznarty is a lecturer at the State University of New York at New Paltz. Currently, he teaches in the Communication and Media department. He writes poetry, short fiction and screenplays. Thomas Cznarty is also a filmmaker and media producer with a strong background in film and television production. 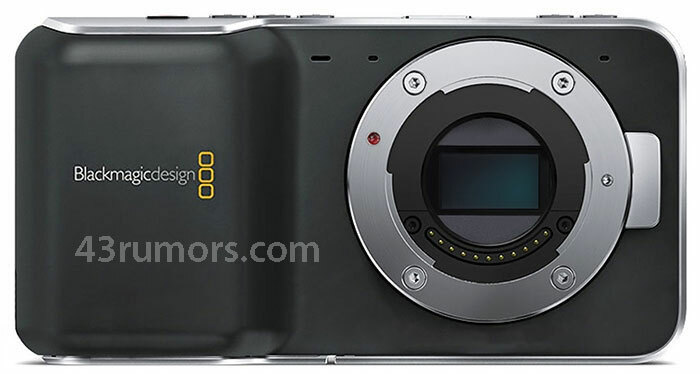 Leaked images of upcoming blackmagic camera surfaced over the web, as you know we have already published leaked images of upcoming pocket camera here… but this time we got the image of upcoming Blackmagic Camera 4.6K URSA Mini, as the name suggest the camera can capture 4.6K video files. But above all the URSA Mini will feature 15 stops of dynamic range, so 4K+ resolution and 15 stops of dynamic range will sure create a bar in camera industry. The announcement is expected today.. we will update you as we get any new information.